From far left: Asyraf Dato Sri Khalid, President of Generasi Bersatu Malaysia, Prof Dato’ Dr. Mazliham Mohd Su’ud, President and CEO of UniKL, Mia Ahmad, upcoming actress with all the three distinguished speakers. 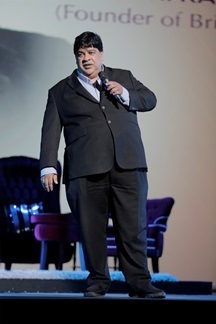 KUALA LUMPUR, 8 Januari 2016 – The crowd rose to their feet by the time the curtains came down on “My Story II”, as three inspirational Malaysians shared their journey on success and failures with the audience at Istana Budaya Kuala Lumpur. 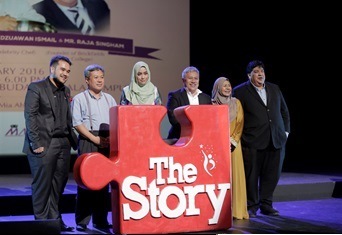 Organised by Generasi Bersatu Malaysia (GBM), an organisation established solely for Malaysian youth and to assist young generation for their development, ‘The Story’ is to inspire all Malaysians, particularly the youth, for them to strive and achieve success in the field that they are pursuing. My Story II saw three prominent personalities, Datuk Redzuawan Ismail, or better known as Chef Wan, Mr Raja Singham, Managing Director and Senior Lecturer at Brickfields Asia College as well as a successful entrepreneur and Fauziah Datuk Ahmad Daud, or better known as Kak Ogy, a successful actress, host, singer, writer, director and producer presenting their stories, their struggles, hardships, experience and knowledge to those present during the event. As a platinum sponsor of ‘The Story II’, around 50 students coming from all campuses of UniKL will be able to join in all sessions under the series of ‘The Story’ carried out throughout the year 2016. UniKL President / CEO, Prof. Dato’ Dr. Mazliham Mohd Su’ud said during the press conference held before the event,” In UniKL, we want to create towering personalities. We want to develop successful entrepreneurs, we do not want to create mere followers but we want to mould leaders in their respective fields. We want to develop job creators rather than job seekers”. Kak Ogy sharing with the audiences how she was shunned by teachers and school mates as a child for being the daughter of performing artistes. A true artiste who regards her profession very seriously, despite her bubbly character. Mr Raja Singham, Founder, Managing Director and Senior Lecturer of Brickfield Asian College and few other businesses. A true entrepreneur in heart. Dato’ Mazliham added, “By collaborating with Generasi Malaysia Bersatu on ‘The Story’ series, I believe there is a lot that we can learn from each other despite coming from different backgrounds. I believe what these young people are doing is admirable, and I believe that there are plenty of positives that UniKL students will gain from this collaboration and exposure. Upon graduating, students of UniKL will be ingrained with FIVE qualities named as UniKL DNA which include Highly knowledgeable, Towering personality, Dynamic leadership, High entrepreneurship values and Always learning and improving oneself”. The Story series is a storytelling session that gathers Malaysian Superheroes that are globally recognised to deliver their stories to Malaysians. GBM together with UniKL is planning more such sessions in the future which will benefit the audience, youths specifically. It is hoped that more people will join these events in the future and learn something valuable to help them push forward in life. Below are some memorable quotes from the speakers on the day. Chef Wan sharing his early childhood struggles at the Army Camp and Felda estate as the eldest among 7 siblings. A true Malaysian hero and ambassador of food and culture.